Artificial lights are a pre-requisite for plant production in no-natural light growing environments. In the absence of sun light the quality of the light (spectrum) is accentuated to the highest degree. As artificial light in no-natural light, is the sole source of light, higher light intensities are also required, than in many supplemental light situations. Higher light intensity also leads to a higher thermal load to be cooled in these no-natural light environments. A superior light spectrum allows, not only for higher crop yields, but also for lower intensities and less energy consumed to cooling too, thus the benefit from Valoya’s lights is very high. LED farming is one of the most innovative ways of up-scaling the crop production efficiency. For this purpose, artificial lights are evidently a pre-requisite for plant production in no-natural light growing environments. In the absence of sun light, the quality of the light (spectrum) needs to be accentuated to the highest degree. As artificial light is no-natural light, and is the sole source of light, higher light intensities are required, in comparison to many other supplemental light situations. In this respect, Valoya’s high light intensity vertical LED grow lights provide a higher thermal load with an efficient cooling system that is necessary in such no-natural light environments. 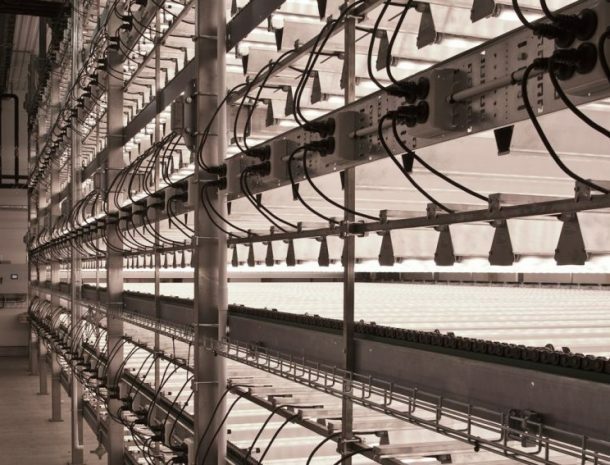 On one hand, such a superior light spectrum ensures much higher crop yields, while on the other it significantly reduces the energy consumption and the need for high intensity in cooling systems. A combination of these high efficiency factors makes the Valoya’s vertical LED grow lights extremely beneficial for our clients. Optimal light spectrum provides increased yields as well as energy savings. Valoya’s spectra enable superior growth at lower light intensities than traditional light or un-optimized generic LEDs. Valoya’s L-series and C-series products are ideal for multitier environments, thanks to their modularity in light delivery (ie. as they are of low wattage per meter, an optimal light canopy can be realized). Valoya’s lights use high efficiency LEDs with optimal passive cooling, with minimal heat radiation towards the plants. This, and the high modularity of the L-series products and the uniform light spectrum (ie. full spectrum LEDs are used, not combinations of red-blue) enables them to be used up to proximities of 15 cm from plants.